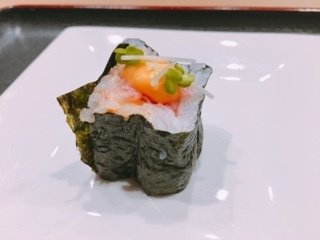 Before sushi became popular, when most people thought California rolls were the real deal, Mitsuhiro Kaji already started serving authentic offerings to those lucky enough for score one of the 30 seats in his quaint Etobicoke restaurant. After trying Yasu, Shoushin and Yunaghi, visiting Sushi Kaji, where Japanese fine dining in Toronto arguably began, was a pilgrimage that seemed important. 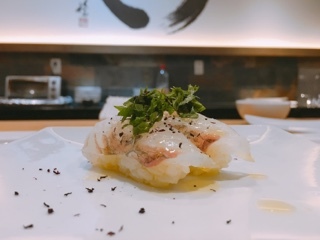 Similar to the later two restaurants, Sushi Kaji’s omakase menus aren’t pure sushi; instead a mixture of small dishes and sushi - for an extra $30, they’ll also prepare a sashimi course. Since it was our first visit, the takumi ($130) experience was in order. 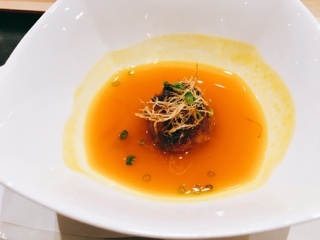 Instead of miso, Kaji presents a bowl of smoky butternut squash soup; a light consistency yet still incorporating a strong powerful flavour. While the broth was fantastic, the chicken meatball was rather neutral and needs to be enjoyed with the soup. As the salads are presented, we’re advised the dressings are on the side so we can customize the potency of the flavours … of course, I ended up adding everything. 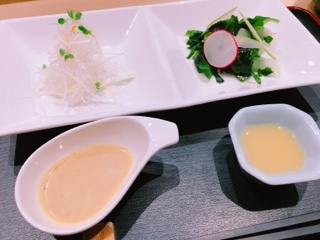 Thankfully, the sugary sweetness of typical seaweed salads was missing, instead, Kaji pairs the seaweed with lemon miso that’s enhanced by slightly sweet radish slices. Meanwhile, the daikon salad pays homage to the legendary Japanese knife skills – impossibly thinly sliced and crispy, so refreshing with a creamy sesame dressing. The salad was a great cleanser before the sashimi. With a dusting of lemon rind on the sea bream and amberjack, the white neutral fish were refreshing. 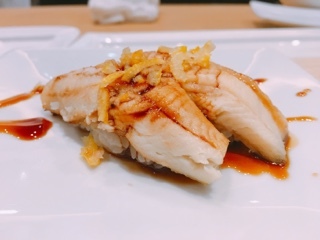 While both these fish are somewhat soft, the Spanish mackerel has a harder fleshy texture having a crunchiness to it, if fish could be crunchy. Surprisingly, Kaji’s sashimi incorporates rich pieces of tuna belly, generally reserved for sushi, which melts in the mouth and best left as the last fish you’ll eat. The relatively large slices of octopus are tender, but left plain so you can still taste the seafood’s sweetness. 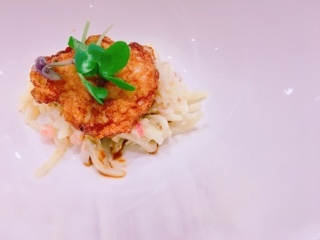 While the satsuma age, a deep fried seafood cake incorporating pieces of octopus and a slight zing from ginger, was tasty, it was the potato salad (yes, you heard right) that was outstanding. Instead of the typical chunks, Kaji shreds the starch into match sticks and mixes the potatoes with micro-fine diced onions, which really makes the side pop. Lastly, before the sushi, a meaty plate of sautéed wagyu leaking its oily flavours onto the equally meaty oyster mushrooms. In the middle, were large chunks of soft braised short rib, lightened by a splash of chrysanthemum sauce. The dish was hearty and swoon worthy – momentarily silencing everyone at the bar except to sneak glances at how much their fellow guests were enjoying it. 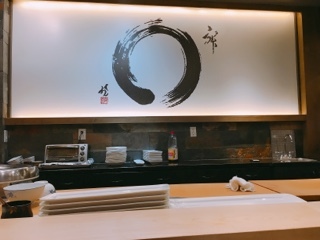 Sitting at the bar allows you to witness Chef Mitsuhiro’s assembling skills. While the entertainment at other sushi bars is watching chefs deftly cut through fish like butter, when it comes to sushi at Kaji, the seafood is pre-sliced… hence why you’re really watching Mitsuhiro assemble the sushi piece-by-piece. Nonetheless, it’s still an entertaining affair with the Chef’s elaborate gestures – with the salsa music in the background he could have been doing the flamingo with each arm flick. I was so entranced by the dance that I missed photographing the octopus – another slice of the tender flavourful protein, except in this case drizzled with olive oil and sprinkling of salt. 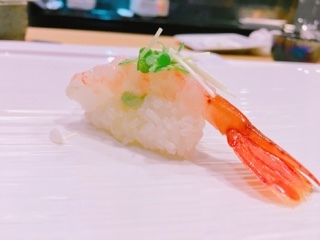 The following raw shrimp, in my opinion one of the worst ways to enjoy this seafood, wasn’t overly gummy as Kaji covered it with a lemony light cream sauce. Yet, not cooking the shrimp does nothing to enhance its sweetness and the consistency raw shrimp is rather off-putting. 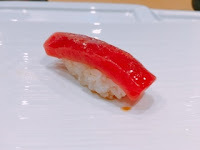 Tuna arrives next with the customary lean (akami) followed by the fatty belly cut (otoro) to highlight how the same fish can offer such different texture and tastes. 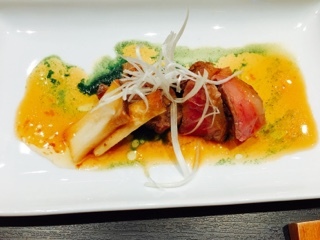 The akami was a beautiful vibrant hue with a strong wasabi finish, while the otoro served whole (instead of chopped into little pieces) so you can really enjoy the marbling. After a quick blowtorch to sear the top of the scallop, this piece was covered with melted butter with a strong kick of black pepper. Indeed, it’ll help mask any fishy tastes that the mollusk may have, but also covers up any of the scallop’s mild sweetness. 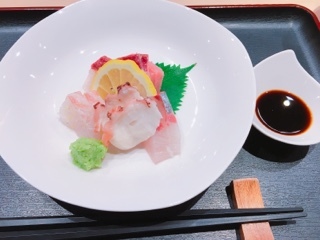 Surprisingly, after the octopus, Kaji also served calamari as well – in this case raw so there’s a sticky chewy texture, but very clean tasting. 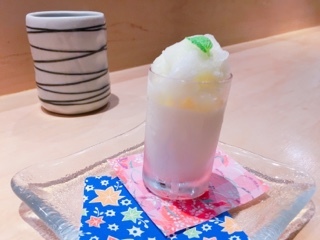 With raw ginger and finely sliced shiso leaf, it’s rather refreshing. 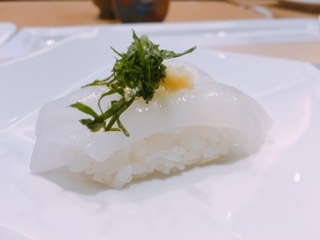 The following flounder (hirame) received a similar preparation with crushed shiso leaves topped with warmed olive oil and salt. A good tasting piece on its own, but too similar to the calamari. Sisho is such a strong herb, akin to a citrusy basil, that back-to-back it’s overpowering. 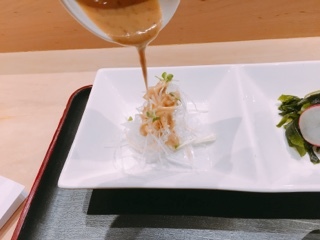 Unlike other high-end sushi establishment, at Sushi Kaji you do get a plate of soy cause and wasabi - rather than the chef swiping on the amount deemed optimal for each piece. 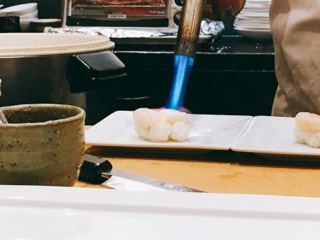 Instead, Chef Mitsuhiro coaches diners on what to do (no soy or little soy). 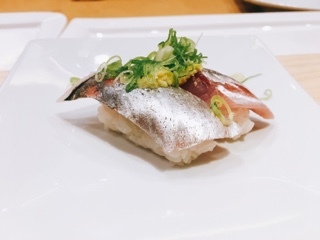 Still, some pieces, like the Japanese horse mackerel (aji) could really use a thicker soy and all the toppings makes it difficult to dip so would benefit from having a helpful swish from the chef. The eel, heated through in the toaster oven with the sweet thick glaze, is absolutely delicious. 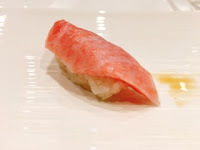 Kaji tops it with lemon rind adding a great lightness to the otherwise richer sushi. To end, a piece of spicy tuna maki. I commend the restaurant for trying to elevate such a common roll with chopped otoro … without any of the dreaded tempura bits mixed throughout. It was certainly better, but the seaweed could be crispier (still rather chewy like the common versions) and the spicy mayonnaise also unexceptional. Chef Mitsuhiro plays with different condiments, marrying Western and Asian elements, so you do get interesting tasting pieces at Sushi Kaji. However, a person can only enjoy so much olive oil and salt. 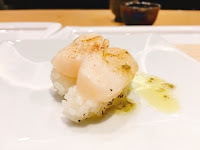 Maybe I prefer sushi traditional, but I found oil and salt tasty with the scallop but really detracted from other items. The entire time I just wanted a swish of condensed sweet soy… where was it?! So many chefs believe the most important part of sushi is its foundation – rice. Although Sushi Kaji’s rice is soft and creamy, it lacks the hit of vinegar I’ve grown to love. The temperature could also be warmer. Interestingly, the restaurant switches the tea before dessert for a lighter smoother blend. 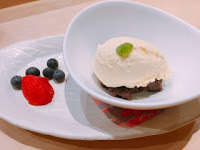 The sweets were pleasant but conventional: a scoop of vanilla ice cream on red bean paste and a run-of-the-mill gelatin textured panna cotta with chopped pears and shiso sorbet – someone really loves this herb! The restaurant’s bar seating arrangement is strange: despite there being empty chairs, they choose to sit everyone right beside the next couple instead of spacing everyone apart. Yet, for a first visit you need to sit at the bar, to fully immerse yourself in the experience. Just don’t expect any privacy.